Each weekend is now being spent finishing the planting of a new mixed hedge(row) round the new kitchen garden which is around 60m x 40m in size. Up here we have to disregard the textbooks and plant regardless of the effects of the last few months of rain (or we'd never plant anything) meaning trenches like the Somme and a lot of sliding around and swearing into the mud as the mountain bikers fly past us on Sunday afternoons. The site of the front of the hedge is exposed, full of rock, and very steep - this due to a paper miscalculation meaning that the raised bed grid of the garden took up rather too much room and pushed the perimeter forward. So to cap off the misery of planting into this we need to assemble some kind of narrow path to facilitate the occasional trim alongside it. The quantity of bracken in this area has led us to not only hand dig its tough black roots out, but also make the decision to plant the hedging into woven landscaping mulch fabric. The woven stuff frays very easily and I don't like working with it as much as the other softer unwoven kind, but I'm told its better. 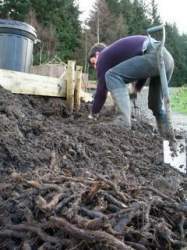 Cutting and fitting round the twiggy plants is slow and tedious work, and of course the whole lot needs a bark or gravel mulch to finish - but in the long run the hedge will get away faster and provide the much needed windbreak the vegetable beds need. The hedge is trenches with wellrotted manure and the plant mix FYI is based on the most vigorous plants in the two very successful hedges so far planted here - one in 2001, now 6' high and one in 2005, now 4' high. Its around 40% hazel with the rest made up of beech, holly, swedish whitebeam, sloe, guelder rose, cherry plum and amelenchier ovalis (this last for the plain reason I managed to grow dozens from seed) with the odd fuchsia for glamour. 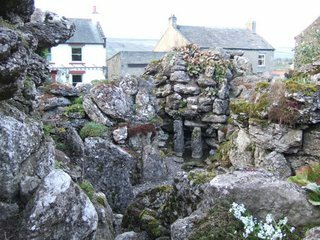 Firstly is 'Aysgarth Edwardian Rock Garden' which I only found because we pulled up right next to it for a quick on-the-road kip. It's a charming old-style rock garden, privately maintained largely and free to visitors dawn to dusk, with a checkered past which even includes garden gnome marketing. A few rare plants suvive and there's an exquisite atmosphere of faded, eccentric grandeur about it all. 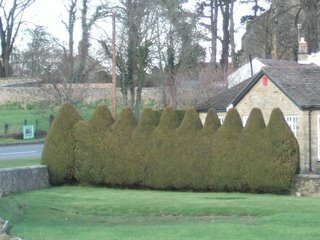 Next, was this fabulous conifer hedge, somewhere near the afore-mentioned garden. What I like so much about it is that although it's clearly formed out of conical-shaped conifers, these individual outlines have been re-instated into the hedge by its owner - almost like carving. 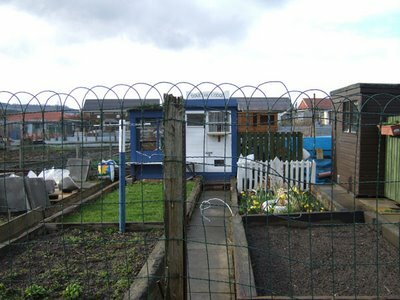 Finally, we detoured near Middlesborough to the magnificent Guisborough Allotments which we spotted from the road, a huge sprawl of colourful plots, each with unique and fascinating idiosyncrasies - buildings, fancy poultry, brassicas, fencing...Long may the developers stay away from this place, it's a remarkable feat of human ingenuity.